Stems erect, stiff, coarse, simple or somewhat branched, 3 to 9 feet high from a perennial root, roughish-pubescent or nearly smooth. Leaves alternate, narrowly oblong to lanceolate, pointed or elongated at the apex, narrowed at the base into slender petioles, or the upper leaves nearly sessile, margins serrulate, 3 to 10 inches long, one-half to 1 inch wide. 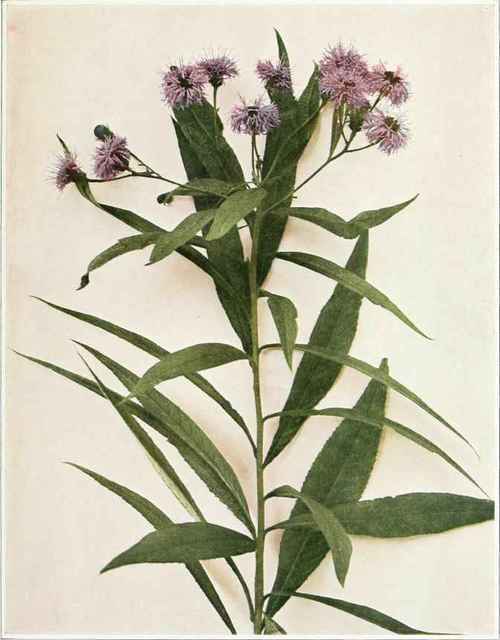 Inflorescence consisting of several or many heads of deep-purple flowers, arranged in a loose, cymose panicle at the summit of the leafy stem. Each head one-third to one-half of an inch broad and containing twenty to forty flowers. Involucre of brownish purple or greenish bracts, overlapping in several series, with long, spreading and slender tips, usually two or three times their own length. Flowers all tubular with a regular, five-toothed corolla. Pappus purplish in color. In moist soil and low grounds, Massachusetts to Pennsylvania and Missouri, south to North Carolina, West Virginia and Mississippi. Flowering in late summer and early fall. In New York, not common north of the lower Hudson valley region and the coastal plain.